Our new Whole Foods has been open for a few weeks now and it is awesome. I am so excited to be working such a great company, plus it is so nice to finally have good food available to us up in the mountains! The only downside is that I am tempted to buy everything, every time I work. Although I think I am going to need to pace myself when it comes to buying things from work. Do you ever end up buying, buying, buying, but not eating any of the stuff you bought? This happened to me and I was left with every type of citrus you could practically imagine. I really hate wasting food, so I decided I would make a sauce with the extra clementines that I had. 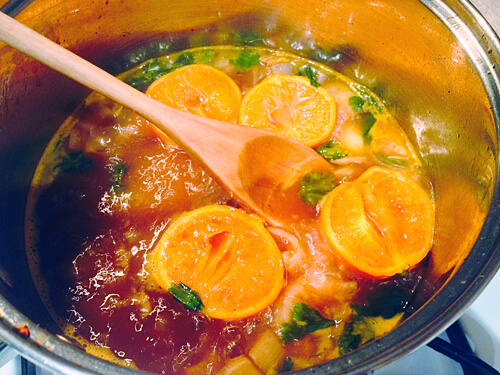 The clementines added an extra sweetness to the sauce that regular oranges don’t have. This was a complete experiment to make an Asian inspired clementine sauce, and it worked out great! So if you are ever hesitating to buy that huge bag of Cuties from the grocery store, do it! You can always use extras to make this delicious sauce! Saute shallot, garlic and ginger (with 1 T oil) over medium heat until fragrant. Add the lime juice, clementine juice and zest, Sriracha, soy sauce, rice vinegar, water, sugar, coriander, black pepper and cilantro. Bring to a boil, then reduce to medium-low. Let simmer for 10-15 minutes, until reduced to about ¾ cup. Strain before serving. Note: If you are looking for more of a glaze than a stir-fry sauce, add a 1 T slurry (cornstarch & water) to the sauce and bring to a boil to thicken. Season chicken with salt and pepper. Bake at 375F until 165F internal temperature (about 30 minutes). 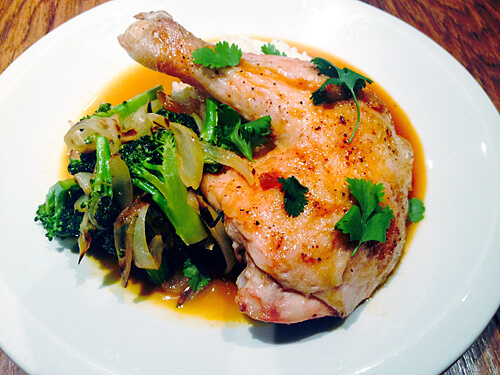 While chicken is cooking, sauté broccoli and onion until soft (about 5 minutes). Serve chicken, broccoli and onions over rice. Top with clementine sauce.